When Princess Gard decided to attend America’s Beauty Show (ABS) earlier this year, she had no idea what to expect. 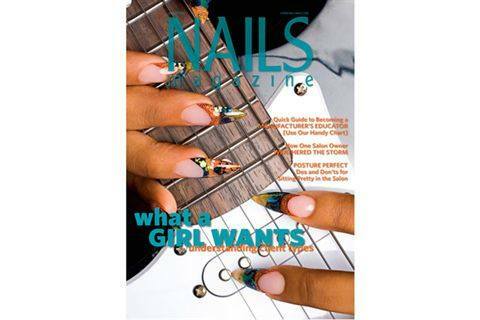 Little did she know her entry would not only win her $500, but also a spot on the cover of NAILS Magazine. When Princess Gard decided to attend America’s Beauty Show (ABS) earlier this year, she had no idea what to expect. She jumped online to look over the show’s website to see if there were any classes or events she wanted to attend. That’s how she found out about the Stars Photo Competition that Cosmetologists Chicago was putting on. 1. 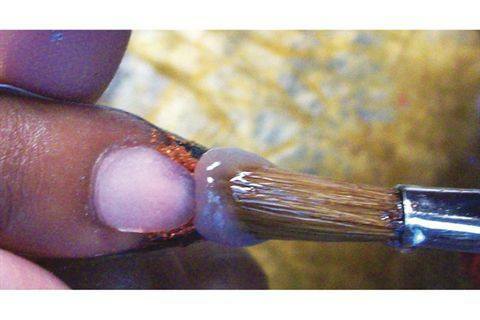 Prep the nail using standard sanitization process. 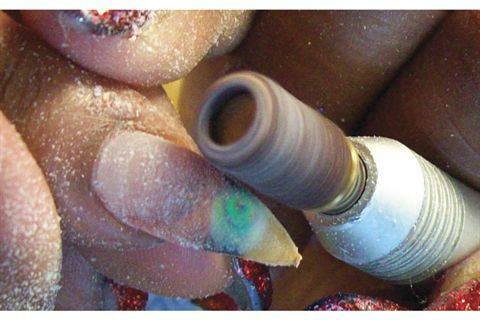 Roughen the nail with an electric file and place form underneath nail. 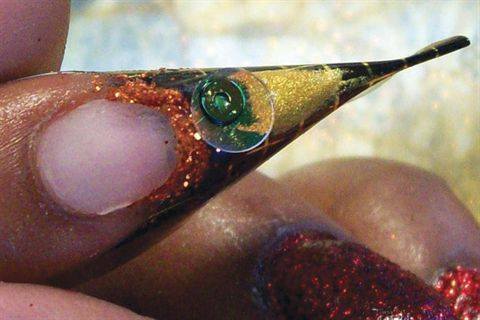 Press in the sides of the form to create a stiletto. 2. Build the nail only to the free edge to created the perfect smile line. 3. 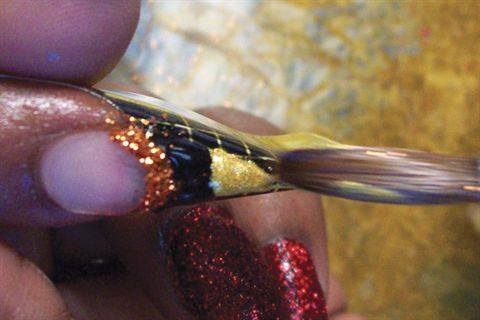 Apply a thin layer of CND Perfect Color Clear to form the stiletto nail shape. 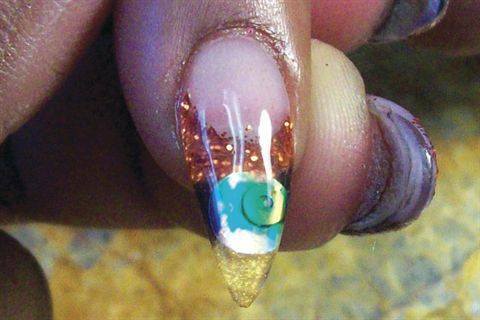 Apply a small amount of Young Nails Imagination Art Golden Orange Glitter. 4. 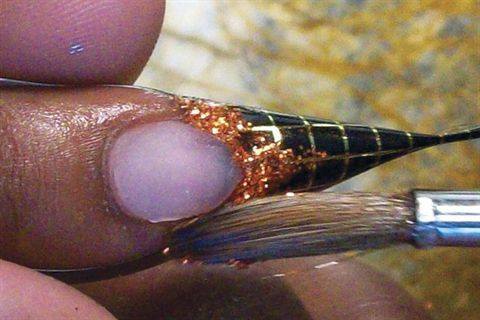 Apply a small amount of Young Nails Rainbow Collection Black powder. Then apply a custom-blended powder at the tip. (Princess used Young Nails Metallic Gold, Rainbow Yellow, and Fortune Glitter). 5. Apply mylar and/or confetti for more sparkle and dimension. 6. Cap the nail in CND Perfect Color Clear. 7. 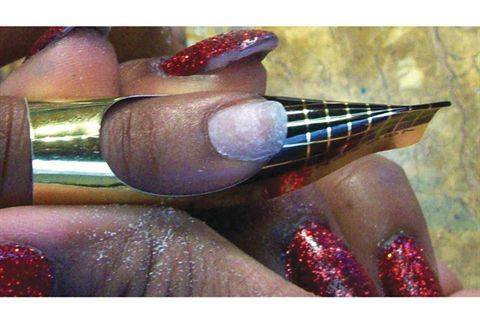 File and shape the nail to get a smooth and sleek finish. 8. 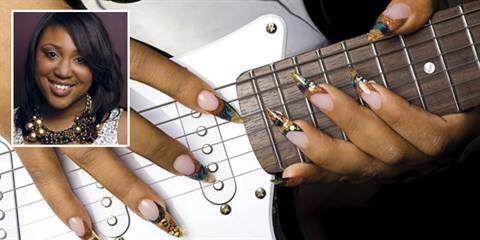 Apply Young Nails UV top coat to add shine and complete the look.